The early history of Delaware is one of conflict between Dutch and English forces, with the Swedes playing a lesser role. The Dutch claim to the area was established in 1609 by Henry Hudson when he sailed into Delaware Bay in his search for a Northwest Passage. The following year, Sir Samuel Argall entered the same waters and set up the English claim. Argall named one of the headlands for the Virginia Governor De La Warr, a name later contracted and applied to a river, a bay, a Native American tribe and the colony as a whole. In 1623, the Dutch West India Company began its involvement in the New World and clearly demonstrated a preference for trading ventures over settlements. A small, ill-fated Dutch settlement, Zwaanendael (swan valley), was founded near present-day Lewes in 1631, but other early Dutch adventurers turned to Sweden to support their plans for permanent homes. Former governor of New Amsterdam, Peter Minuit, received Swedish support in 1638 to establish Fort Christina in New Sweden, a fledgling colony (near Wilmington). Dutch interests in the area were advanced in 1651 when Peter Stuyvesant of New Amsterdam built Fort Casimir (near New Castle). Three years later, Swedish forces staged a surprise attack and took the fort, only to lose it back to the Dutch in 1655 when Stuyvesant captured all of New Sweden. 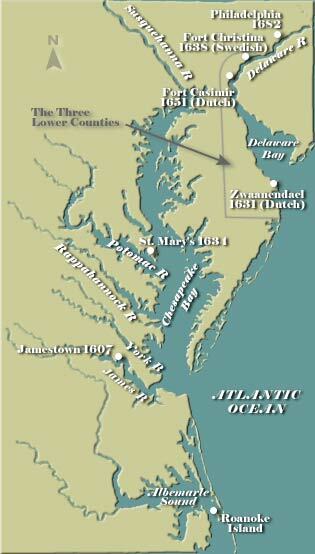 Dutch control in Delaware lasted only about 10 years. The Duke of York (later James II) took the entire area, including the New Netherland, in 1664. A brief Dutch return to power in 1673 was important primarily because the "three lower counties," today New Castle, Kent and Sussex, began to be regarded as an area distinct from neighboring ones. In 1682, the Duke gave the three counties to William Penn, which provided his colony with Atlantic Ocean frontage. Many residents resented the change because they regarded Pennsylvania as a bed of radicalism, but they were mollified by Penn's decision to give the three counties equal representation in the assembly. As Pennsylvania grew, the counties feared loss of influence. Penn responded in 1701 by granting them a new charter authorizing the institution of a separate assembly. The first assembly met in 1704, but the area remained under the Pennsylvania governor's control until 1776. Penn and Lord Baltimore of Maryland disputed over Delaware's boundaries for years. In the 1760s, the boundaries were surveyed by the English scientists, Charles Mason and Jeremiah Dixon. See also early history of Pennsylvania .